US M65 280mm Atomic Cannon. One of eight survivors and I believe it is the only one with the two "Prime Movers" attached. 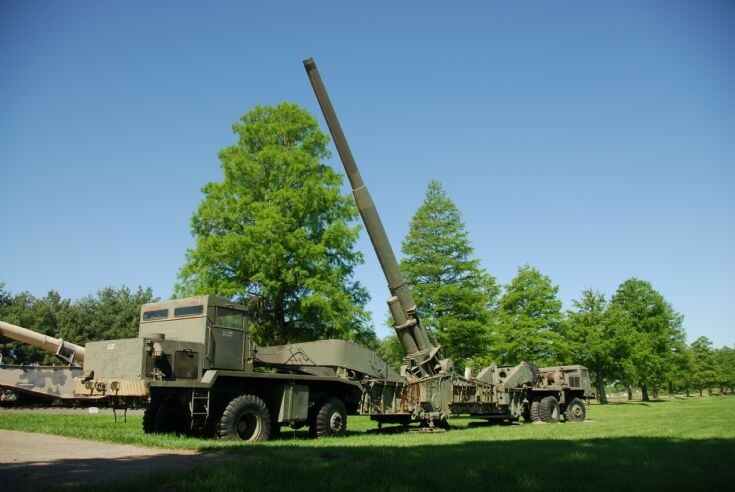 Taken in May 2009 at Aberdeen Proving Ground. Nice picture. Do you know what the prime movers manufacturer is? Added by AlfvanBeem on 13 November 2010. Afraid I don't know who the manufacturer is. The only info that I have been able to find is that the Front is M249 and the Rear is M250. Added by Tony Walsh on 14 November 2010. Added by Roger Mason on 08 February 2011. Only 20 were built, 16 of which were stationed in Germany. In service until 1963. Added by Roger Greenaway on 09 February 2011. Thanks for the info, always good to have that little bit extra. Added by Tony Walsh on 09 February 2011. There is a beautifully restored atomic cannon in Albuquerque, New Mexico. Complete with both prime movers. I saw it at the National Atomic Museum which was at Kirtland AFB before 9-11. The museum has been moved into the city of Albuquerque. Not sure if the atomic cannon has been moved or not. Added by Mark Holloway on 05 March 2011. Hi Mark, Thanks for the info about another 'complete' unit. Would be interesting if anyone knows where it is now. Added by Tony Walsh on 06 March 2011. I just got an e-mail from the curator of the museum in Albuquerque. The cannon and both prime movers have been moved to their new location but the movers aren't connected to the cannon yet. If you search the name of the museum you will find their web site. Added by Mark Holloway on 07 March 2011. Hi Mark, thanks for the address of the Museum and the comments on their cannon. I'll give it a look. Added by Tony Walsh on 08 March 2011. If you go to YouTube and search "280mm" there is a good video showing the nuclear tests in Nevada. Also footage of the cannons on the highway between Las Vegas and the Nevada Proving Grounds. Added by Mark Holloway on 08 March 2011.